Plotter Epson Stylus Pro 9890 with CISS - Inksystem - save money on ink! Epson Company declared, that Epson stylus pro 9890 printer is an industrial device, which is meant for usage in the area of typography and could make prints of different formats, including A0 format. Its ink tanks contain nine colors, due to which you will get vivid and colorful prints. Thin Film Piezo printing head, which has the latest design, consists of eight channels and has increased amount of nozzles. They are used separately for each color. This printer also has improved design of paper feeder, which provides speedy printing process. 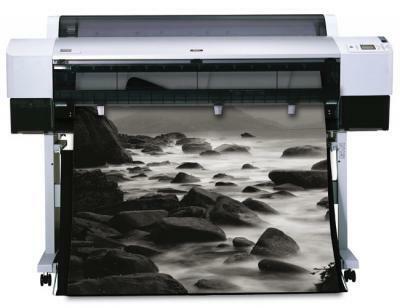 Epson 9890 printer uses the latest printing technology, which allows you to print with variable size of ink drops. With this innovation the printing speed will be high and at that the quality will remain on the same high level. Due to the usage of ink droplets of different size the reproduction of half-tints and solid color areas is achieved. A special attention was given to this technology during the presentation of epson 9890 and the similar models in this class epson stylus pro 3880 and epson stylus pro 9900. The printing speed of this device is about 46 square meters per hour. You can use more than two cartridges and change them without print head. Stylus pro 9890 epson was meant for industrial printing. It is an excellent alternative to laser printers, because it could start to print without pre-heating and has rather high characteristics of printing speed in monochrome mode as well as in color mode. It will be a perfect assistant in printing different maps, drawings and advertising materials. Epson UltraChrome K3 Vivid Magenta pigment ink doesn't penetrate the paper. It lays down on the paper surface smoothly. It will not be visible from overleaf, if you use standard office paper for Epson stylus pro 9890, that is why you can use double sided printing mode. The pigment ink Epson UltraChrome K3 Vivid Magenta was designed for Epson printing devices, it will provide you with high quality of photos and other documents on photo paper as well as on standard office paper. It allows you to make borderless photos on glossy or matt paper of 13x18 cm, 10x15 cm and A4 format. At that you don't have to use additional photo cartridge. The design of Epson stylus 9890 is classic. It has become standard for modern printing devices long ago. On the front panel a tray for paper feeding is located. Also, there is a receiving tray for printed sheets, it has a handy design. During printing and loading of blank sheets, they are holding splendidly and don't fall out of the tray. The printer has a take-off assembly, which never grasps an extra sheet. It stands to mention, that epson pro 9890 printer has a high level of dust protection, even if you don't use it. Epson stylus pro 9890 uses nine colors of ink. Due to its borderless piezoelectrical technology of printing and resolution up to 2880?1440 dpi, you will get high qualitative prints. The printing head is a key element of this technology. Now, it is not a consumable material, but an integral part of plotter Epson 9890. You don't have to purchase it apart of the main device, and it influences the consumables price positively.